Recipe for Garlic Vinegar. Makes about 1 pint (570 ml) of Garlic Vinegar. 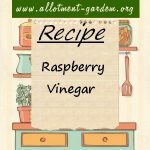 Adds interest to a salad dressing and can be used in stews, soups, sauces etc. Recipe for Chilli Vinegar. Adds interest to a salad dressing and can be used in stews, soups, sauces etc. Makes about 570 ml (1 pint) of Chilli Vinegar. Recipe for Marjoram Vinegar. Adds interest to salad dressings and can be used in stews, soups, sauces etc. Herb Vinegars make a lovely gift.. Recipe for Sage Vinegar. 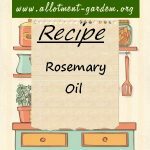 Adds interest to salad dressings and can be used in stews, soups, sauces etc. Herb Vinegars make a lovely gift. Recipe for Thyme Vinegar. Adds interest to salad dressings and can be used in stews, soups, sauces etc. Herb Vinegars make a lovely gift. Recipe for Garlic Oil. Makes about 1 pint (570 ml). Garlic oil is great for making a salad dressing or just as a pouring oil to go with vinegar on a salad. Recipe for Chilli Oil. Makes about 1 pint (570 ml). Chilli oil is useful to have at hand both to use to make a zingy salad dressing and as a cooking oil. 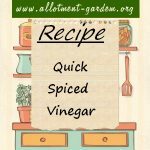 Recipe for Quick Spiced Vinegar. It is very useful to have in your store cupboard as it can be used in a lot of pickle and chutney recipes.